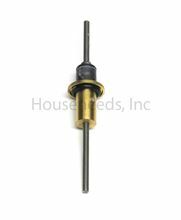 Bosch Aquastar 170VP Water Valve Pushrod - 38475 - Non-Returnable. If you don't see a part for your 170 VP water heater listed - then it is no longer produced. The manufacturer is phasing out Aquastar 170 VP Parts. Warning! All parts are non-returnable. Bosch Aquastar Water Heater repair parts ship via Fedex or USPS. Most small, light weight parts on this page ship via Post Office. Please be sure to provide us with a valid postal address if it's different than the UPS address. You should receive most shipments within 2 to 10 business days. If you have searched for a part and can not find it - make sure you have contacted Bosch Water Heating directly to obtain an exact part number. If you still can not find the part - we can special order most parts that Bosch Water Heating provides. These parts are special order and will take longer to process than normal repair part orders. So expect these special order parts to take an extra 2 or 3 days. Before you call us, make sure you have done the following: Make sure you have obtained the exact part number from Bosch Water Heating If you do not have an exact part number - we will not be able to help you! Bosch Water Heating strongly recommends the use of a qualified service technician for installation or repair of any gas or electric water heater. When directly purchasing a service part, the buyer is responsible for its safe installation and repair, and cannot hold Bosch Water Heating or Houseneeds.com liable for any improper use or installation of that service part.